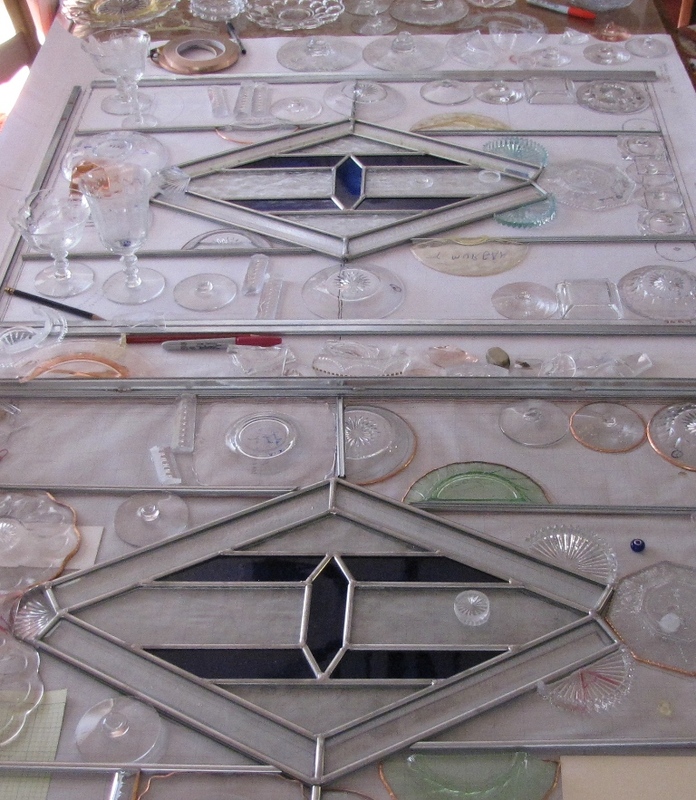 The two panels will be mirror images, as supplies permit. Center large diamond H will be made of cobalt blue to match Heisey’s cobalt blue. I will fill in the diamond with a textured clear glass background. 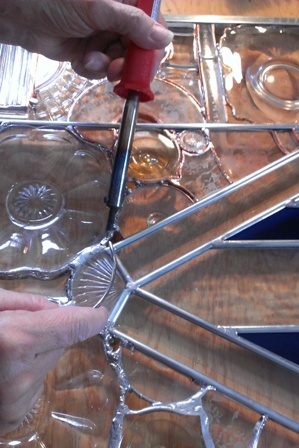 Surrounding the diamond will be a set of simple clear bevels. 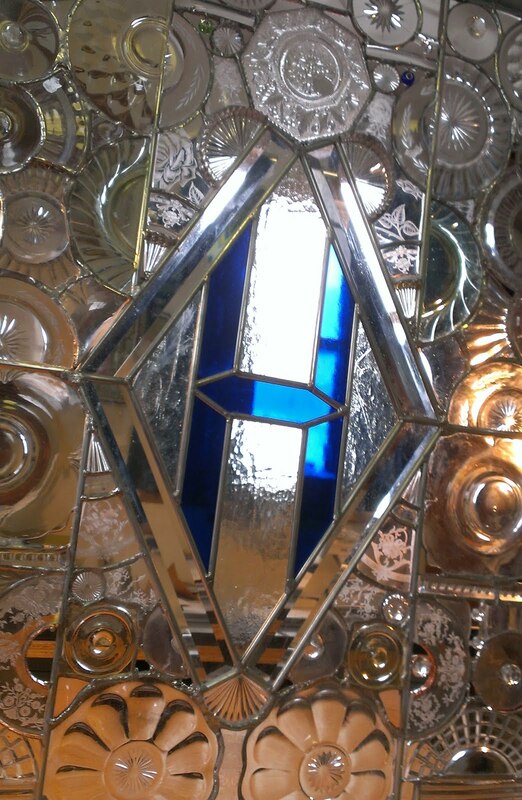 This center diamond H will comprise the extent of "standard" glass within each panel. Every other piece around it will be Heisey. At this point, I anticipate general dimensions reaching: 24” by 36” with the lower unit being 24” by 18”. I hope that there will be a possibility of the lower part being a separate enclosed panel. This would give us the potential to have a solid, non-glass, part of the door across where the push-bar would go across the door and obscure any of the pretty stuff! 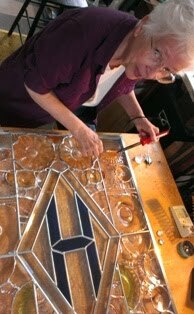 The outer border around the panels will probably consist of round and square bases from 3 oz. glasses. These bases are sliced off of broken glasses, a process of "harvesting" which I'm still trying to figure out. 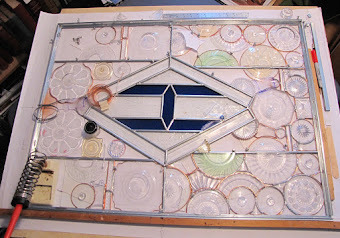 I plan to fill the top panel-corners with larger saucers. The lower corners nearest the push-bar would be nice filled with in square pieces, perhaps lids or stemware bases. For colors within each panel, it's going to be a challenge to fill in the panels with much of anything but "clear". 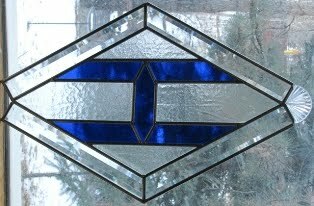 The cobalt blue center H will really stand out, of course, but I do hope to incorporate as many other Heisey glass colors as can be collected/supplied. There are so many lovely greens, pinks, yellows out there. It would be a shame to exclude them from this project. 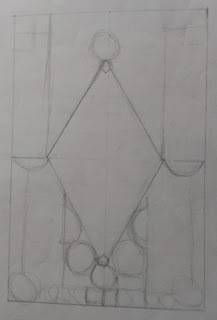 For the bottom sections of each panel, I am planning to design a special dedication space. 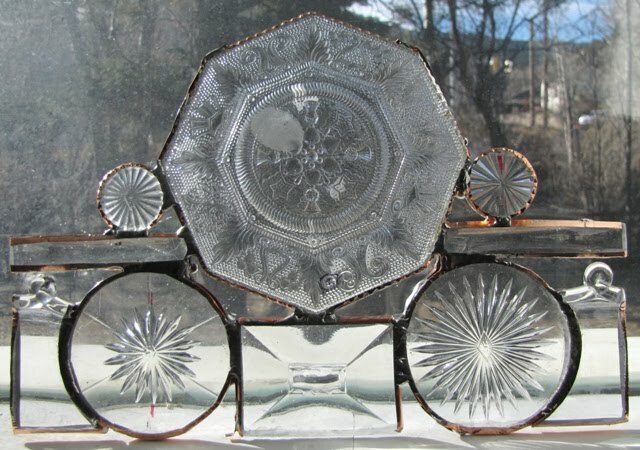 Dedicatory space will include a single engraved plate embraced by two cobalt side pieces showing important dates. Additionally there will be a bar on the bottom displaying “done by” information. Text will be included on the panels via engraving/sandblasting, of course. 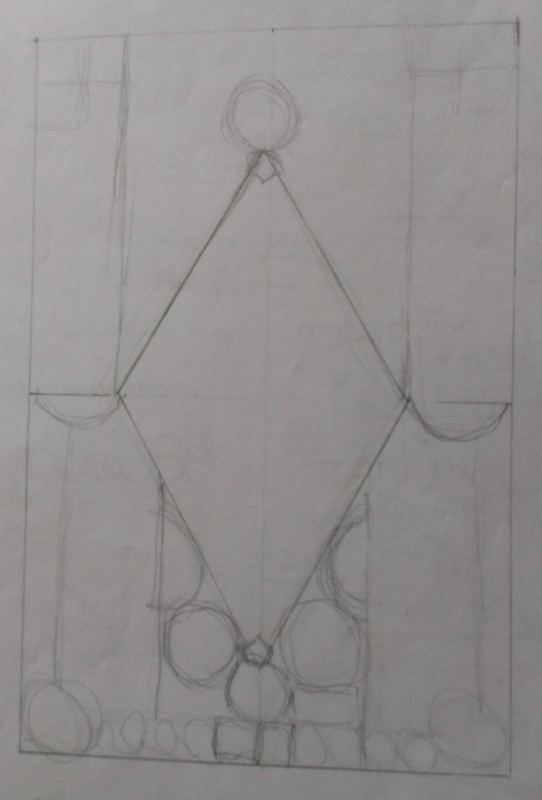 Final panel dimensions will be at least partially determined by the door dimensions and the physical inset requirements which we'll pin down later. 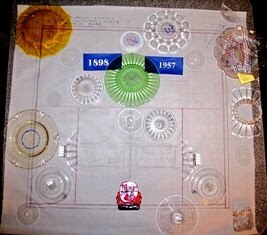 It would be very nice to have at least a 1 inch interior space between the exterior "sealer" glass sheets that will protect (as required by code) these unique glass panels. 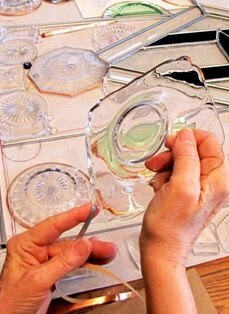 This space will allow for the various thicknesses of pieces and it will greatly enhance my ability to build panels that highlight not just the patterns of the glass on display, but the dimensional and sculptural quality of the assembly as a whole.